This rapidly expanding Bay Area chain of sandwich shops got its start in the Castro neighborhood of San Francisco, and its devoted following has multiplied phenomenally in the seven years of its existence, enough to support 13 stores in all. I was glad to bypass the legendary lines at the original location and accepted a friend’s invitation to check out the Danville store. –is dwarfed by the options shown in their online menu. 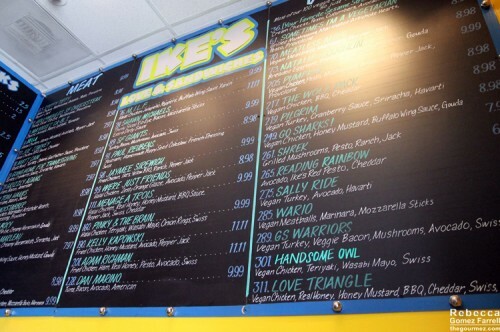 It might be an overwhelming number of choices, but I like not having to compile my own sandwich ingredient list, and Ike’s has nearly any combination you want covered. That includes sandwiches stuffed with jalapeno poppers! Vegans and vegetarians also have a bevy of options, and lettuce, tomato, and onion are givens. Friend #2 cleansing his palate before the meal. 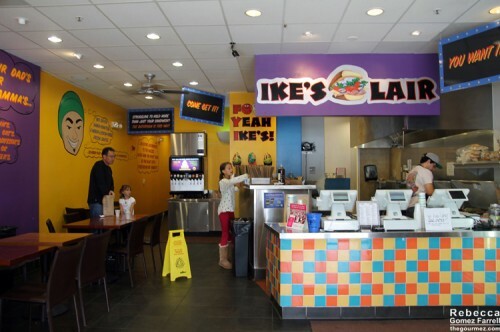 Every sandwich comes with Ike’s signature dirty sauce, which tasted to me like a creamy horseradish sauce…but really, really light on the horseradish, which made it very good. The interwebs tell me that it’s actually a garlic and herb sauce, but I’d swear there’s a little horseradish hiding in their somewhere. 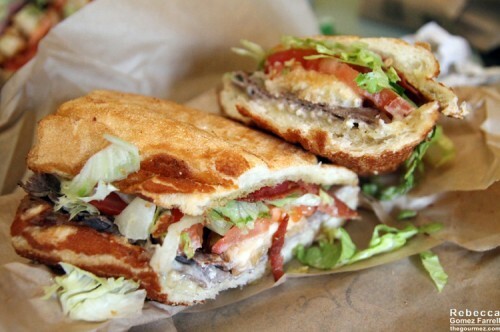 The sauce is grilled into the bread and also added to the ingredient pile—some sandwiches even come extra dirty. The messier a sandwich, the more likely I am to love it, so I thought those methods were fantastic. Friend #1 and I decided to split two gigantic sandwiches, and we chose dutch crunch bread for both, although they have all the other standard options. It’s some of the softest dutch crunch I’ve had! The star of our choices was absolute the Shawn Michaels, made with bacon, extra dirty sauce, mozzarella sticks, and thinly sliced rib eye steak. I’d had a gut instinct to try the steak and it did me well! The bacon had the more lingering flavor, of course, but it was outnumbered by the steak 2:1, which meant both had their chance to shine. The mozzarella sticks merely functioned as a unique cheese delivery system, and the dirty sauce went very well with everything else. As Friend #1 noted, the herb flavor from the grilled bread was phenomenal. A+ just for that. 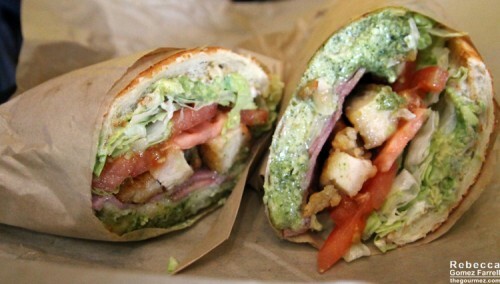 The Adam Richman comes with avocado, fried chicken, ham, pesto, honey, and swiss. I always love the combination of swiss and pesto, and this sandwich was solid, but it wasn’t as perfect of a union as the Shawn Michaels. The fried chicken and honey threw off the blend as the sweetness was unneeded and the coating just sort of dissolved off the chicken. A thick, crunchy coating would have done wonders to guide that sandwich toward its zen. I must note that Friend #1 was super bummed she didn’t see the Damon Bruce before we ordered, because she’d had it before and it had been near-orgasmic (my words, not hers). That one comes with onion rings, provolone, steak sauce, and the rib eye. 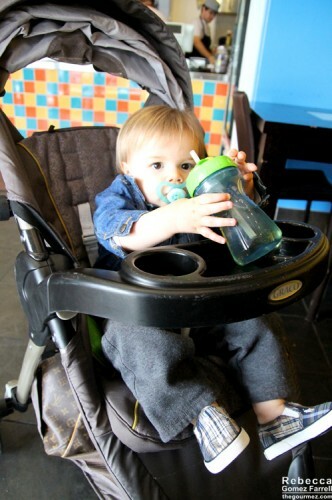 Friend #2 was obsessed with the caramel apple suckers that came with each order—so obsessed it was temper tantrum time when he didn’t get to keep it in his mouth! I felt bad…until I taunted him by continuing to eat mine. The Gourmez is cruel folks. She taunts babies. 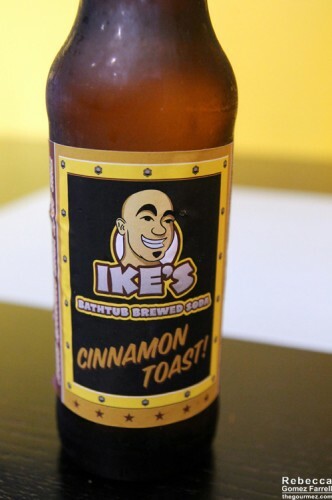 I must also note that Ike’s has its own line of sodas and my cinnamon toast flavor was nearly as good as the Shawn Michaels—better than the Adam Richman, I’d say! Not only is that a cool label, but the soda perfectly captured the flavor of its namesake, managing a creamy custard flavor and just enough cinnamon to be shy of spicy. Friend #1 also noted coconut in the mix, and while I hadn’t noticed it before, I couldn’t stop noticing it afterward. Because I love coconut, that only made it better. 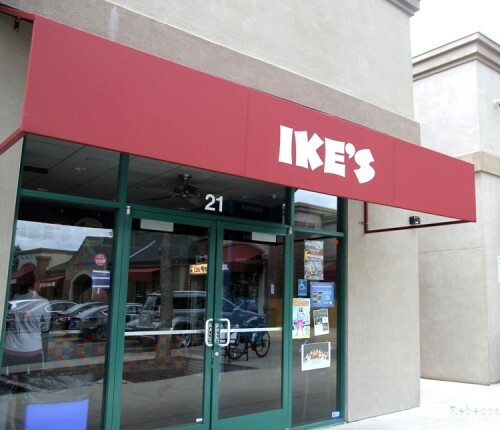 Will I dine at Ike’s again? I could spend my life working my way through the menu on a quest to find the best sandwich of them all. That’s my answer. The Matt Cain and Nacho Boy are also delicious but by far the Damon Bruce is the best. I am intrigued by the Nacho Boy name. What’s in that one? There’s one in our neighborhood and I’ve wanted to try it. But they close at 5pm. Freaking why can’t they stay open til 7 and at least get an early dinner crowd up in there?? They might as well shut down at 2 or 3pm. I have had many rants about such early store hours, believe me. I feel your pain, as a night owl. Aim for a Saturday! It’s worth it, even if they should really be open later. Silly short store hours.